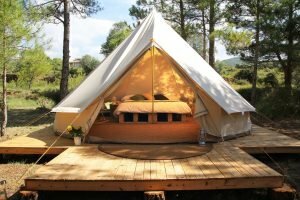 Glamping Surf Camp for whole Family in France - Everybody learn to surf! Do you love taking your family camping but hate the inconvenience of it all? What if you could spend time in the great outdoors without the worry of setting up camp, cleaning up, and spending the night on the cold hard ground? Glamping surf camp is the best of both worlds: the beauty of nature plus the luxury of comfort and tranquility. It’s a meeting of the minds when it comes to what one family member wants from a vacation and what the other person must have, such as a comfortable bed to sleep in. 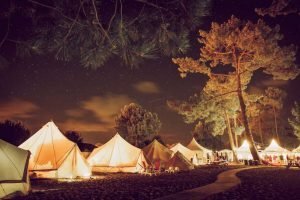 Glamping surf camp accommodations often include either a large tipi style tent, a yurt, or a shiny retro Airstream trailer. Inside your shelter, you will have a bed or sometimes a hammock where you can sleep tight and in comfort. Store your clothes as you would at home in a simple dresser or relax in a rocking chair. When your glamping and you want to make dinner, expect to find a small kitchen with amenities such as coffee makers and toasters. Glampers also enjoy hot showers in clean restroom facilities – always nice after a long day of hiking or playing at the beach. There are so many inspiring places to glamp that it can be hard to decide where to take your family glamping. Whether it’s the mountains, lakeside, or the desert, they can all be great destinations to spend some quality time in. One of the best places to go is the ocean; there’s something for everyone at the beach. Whether it’s swimming, surfing, or building sand castles, everybody loves spending time at the beach. Glamping surf camp is a great way to spend your vacation. Whether you are new to the sport or a pro, it is an excellent way to learn and grow with qualified instructors. If you’ve always wanted to learn to surf, vacationing at a surfing camp is a good way to get one on one daily lessons. No matter what your age, learning to surf is for anybody who loves the beauty of the ocean. Family surfing builds togetherness as you learn to ride the surf together. Children can start learning to surf as early as 7 years old provided they already know how to swim. Kids under 7 enjoy their family surfing trip playing and learning about the ocean in a safe environment. The beauty of taking a family surfing vacation is that your entire family gets the chance to relax, play, and have fun at the beach. Surfing camps offer more than just surfing too. Many camps have other activities such as yoga classes, complimentary bicycles so that you can explore the beach and horseback riding. There are areas specifically designed for kids to play in like slip and slides, crafts, and supervised play groups. Parents can take a much-needed break that they need by relaxing with a glass of wine while their children play or read a book on the beach. The beauty of staying at this kind of camp is that you have amenities that you wouldn’t have if you were camping. Food is always a big part of any vacation and the ability to store and cook delicious locally sourced meals is a big plus. Imagine having a refrigerator, sink, and stove at your disposal and the inspired cuisine that you could make. When your meals are done clean up would be easy and you’d be back at the beach in no time. Many ocean camps are in destinations that have nearby attractions to explore. There are often museums, shops, and recreational activities for the family to enjoy. You may find day trips, chartered boats, or even an amusement park to experience. Your camp host can assist you in finding family-friendly excursions that will enhance your total vacation experience. Once you make the decision to take a surf holiday it’s important to find a camp that cares about quality. Look for surf instructors with experience and who love what they do. Check out the accommodations for comfort, safety, and luxury to make sure that it’s what you and your family will love. Look at the surrounding area to see what other attractions there are to see when you’re ready to take some time away from the surf. Now that you know how to glamp at the beach, imagine yourself there with your toes in the sand. Wouldn’t you love to spend the day surfing with your kids and enjoying an evening meal with new friends? It’s time to plan your next vacation glamping surf camp style.